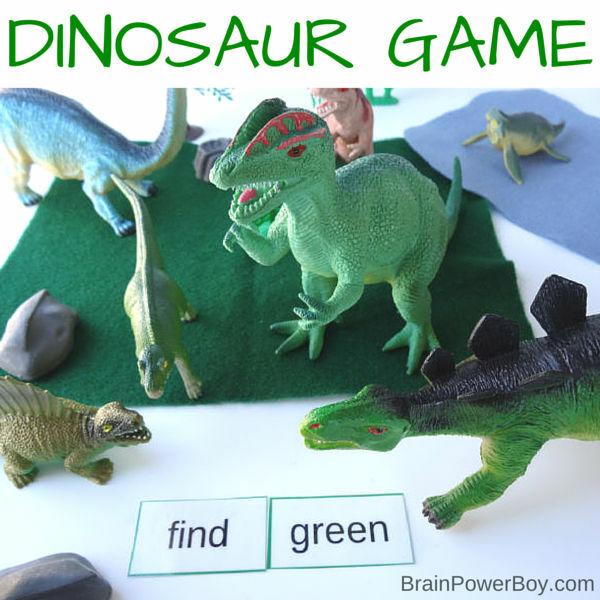 Here is a Dinosaur Free Printable Sight Word Game for you. In creating this our goal was to come up with a game that was hands-on, covered some preschool sight words and kindergarten sight words, and was super fun. We also wanted it to be quick and easy to set up. I think we accomplished all of these things. 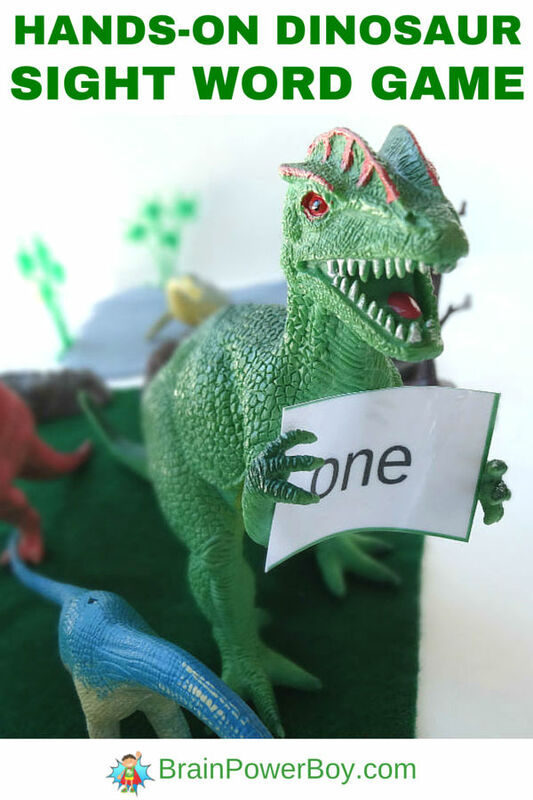 All you need to play is our free printable and some plastic dinosaurs. 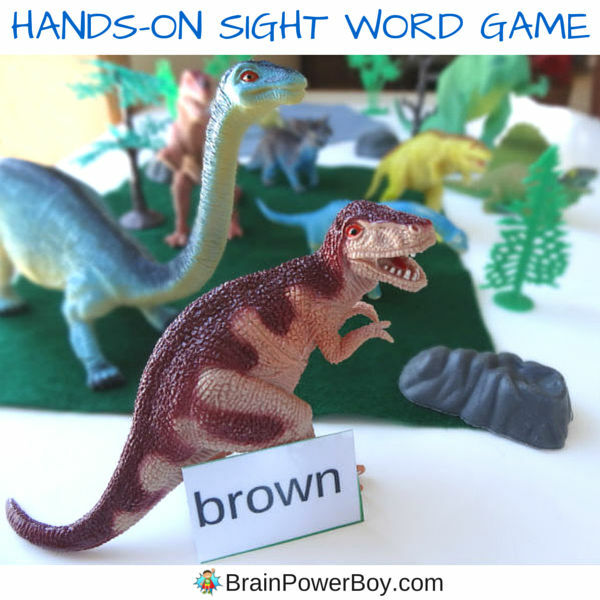 I made a video to give you some ideas for playing this dinosaur free printable sight word game. Enjoy! This sight word game is a lot of fun and is so easy to put together. It will only take a few minutes to set up. The sight words we used are from the preschool and kindergarten sight word lists. We choose words that would go well with the dinosaur theme and would involved some action as well. So you will see up, down, run, and jump in there which means you can get kids moving! Laminate your printable sight word game and cut out the word cards. To play the game simply set up a dinosaur scene. I used some felt as well as rocks and trees to give it a nicer look. It should be inviting. Lay your cards in groups next to the area. I put colors together, then little/big, up/down, run/jump and other cards that are similar in little piles. Let your child pick a card with a dolch sight word on it. We will use the picture above as an example. He picks the card with the word “brown.” He can then find brown dinosaurs. Easy as that. You can also put two cards out and he can sort dinosaur according to the words shown. In this case we add the word “find” to other words to let them use two sight words together. “Find” the “green” dinosaurs as in the picture above or “find” “three” dinosaurs. When using the action words such as run, jump, up and down you can have them take the dinosaurs and make them jump and run or let them jump and run with the dinosaurs. Many boys tend to really enjoy that part! For additional ways to play and to see how we set up our game, watch the video below. Play with the words for a bit and then see if they want to continue. If not, just leave the cards laid out and let them play dinosaurs. They will be learning and using their imaginations. Please leave a comment to tell me how your boy liked the game and if he came up with any new ways to play. 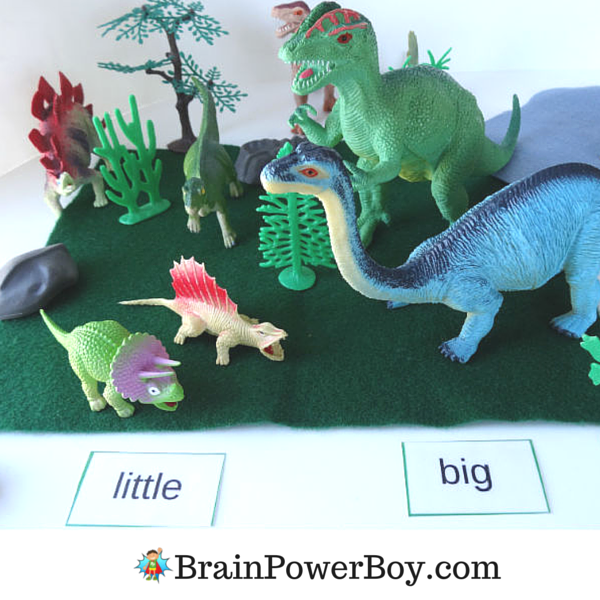 If you liked this dinosaur free printable sight word game be sure to see our other fun learning activities. What an awesome idea! And my daughter just got a new dinosaur figurine set for Christmas. We’re going to use this version to practice some spelling words!